Honestly. This run of Action Comics by Dan Jurgens, which draws to a close with this volume, has been one of the most thoroughly enjoyable, satisfying runs on Superman I’ve ever read. Every other post on this site has either been a glowing review of a book or just commentary on how DC Rebirth has really hit the sweet spot when it’s come to Superman. I ordered this book a month ago knowing full well it would be the last volume of Jurgens’ shepherding of the book, and part of me didn’t want to read it because I did not want it to end. Action Comics Vol. 5: Booster Shot collects Action #993-999 as well as the Action Comics Special which came out shortly after #1000, meant as bookend to Jurgens’ run, picks up immediately where “Oz Effect” left off. At the end of Action #992, we read that Superman has gone into Krypton’s past in search of the truth of “Jor-El’s” claims. 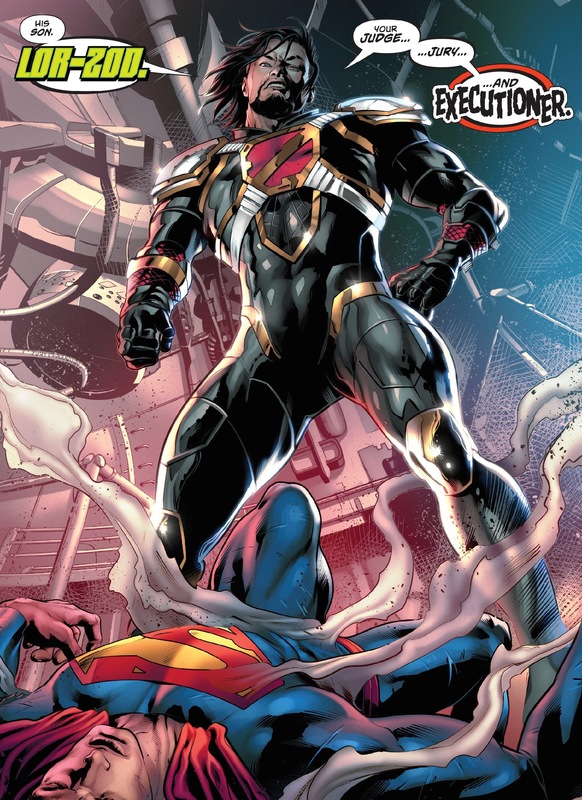 Is the mysterious villain who has shadowed Superman these past five years really his father? Was his father saved from the wreckage of Krypton’s explosion by a mysterious force, as was purported? If so, what does this mean about Krypton’s history, and the House of El’s lineage? This and more is discussed in this trade. 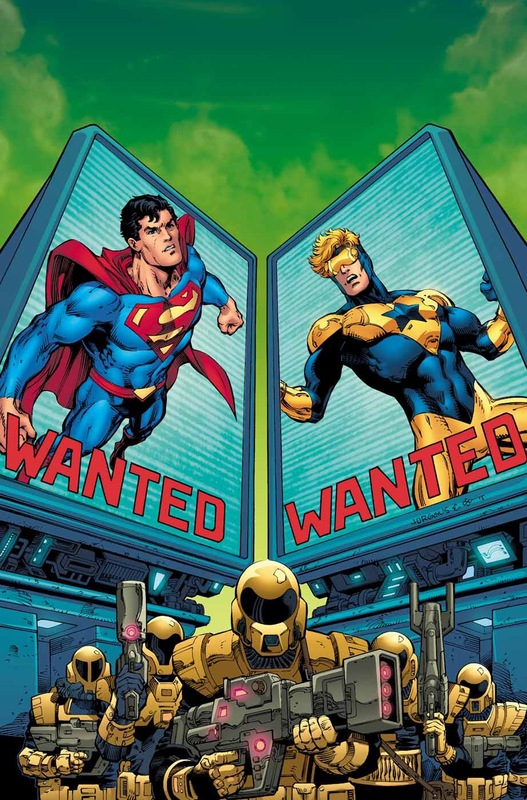 Of course, for Dan Jurgens, it’s only a matter of time before he brings Booster Gold into any story he’s writing, as he himself has said on many occasions. 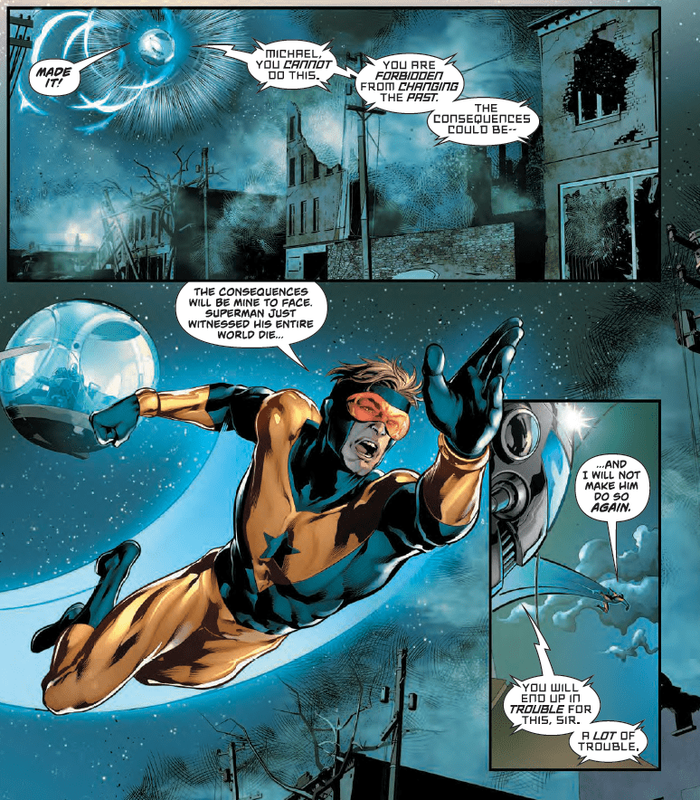 Arguably his greatest creation and addition to the DC mythos, Booster lends himself perfectly to any time travel story, and time travel lends itself perfectly to this particular story. This volume has the feel of Dan’s Booster Gold series from the mid to late 2000s which he worked on with Geoff Johns, which was fun and very well received, so I imagine this, too, had a similar reaction. Ironically, these first two chapters are probably the weakest of the entire book. Dan Jurgens has been one of my all time favorite artists for a long time, but in today’s digital era I just don’t find that his work holds up quite as well. Anything he did in the ‘90s is legendary (with Brett Breeding, especially), but here it feels a bit… I dunno, old, somehow. The story is still good, but thus far in Action, I’ve enjoyed seeing Dan Jurgens’ strengths as a writer, which are more pronounced when someone else is working from his script. 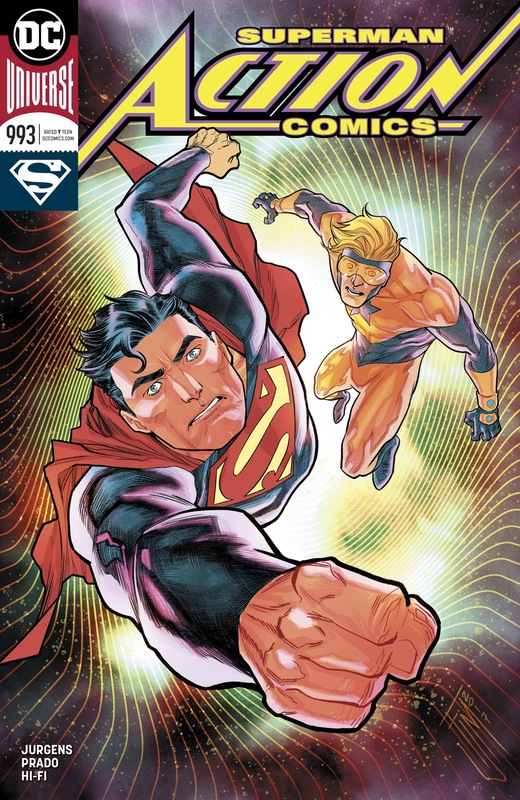 On top of that, with Booster narrating these issues and Jurgens drawing them, they don’t feel like a Superman book but more of a Booster Gold book guest starring Superman, which is okay, but not what I’m hoping for when I read this volume. Still, by no means is it terrible. Two of the next three issues are penciled by Brett Booth, who seems to have made a comeback in the comic industry ever since New 52 (which seems to be a trademark of Bob Harras in his tenure at DC as editor-in-chief, along with other signature features of comics in the ’90s- Greg Capullo, Scott Lobdell, Liam Sharp, foil covers, etc). 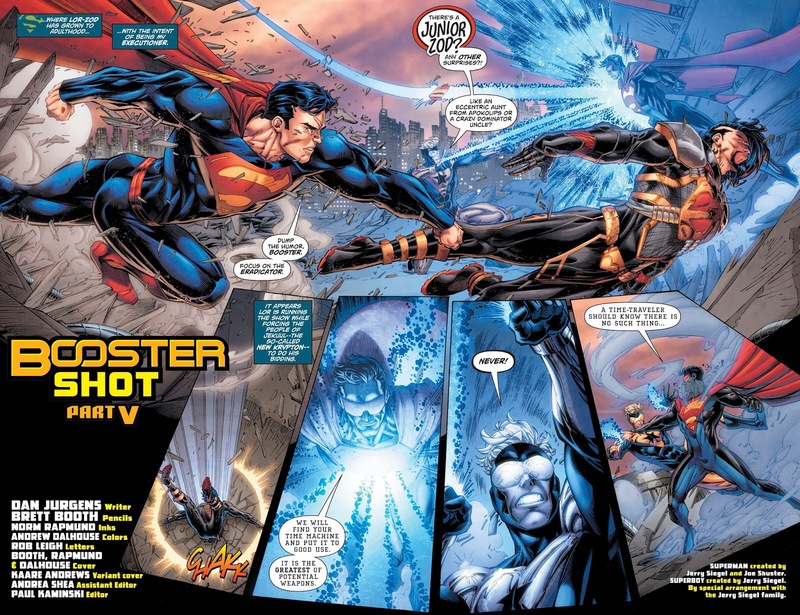 The action picks up as Superman and Booster try to find a way to access the moment of Krypton’s destruction, but of course, things go wrong and instead they bounce around to different time periods. Booth actually draws a pretty good Booster and a decent Superman, even if he isn’t my favorite artist who’s ever worked with Jurgens. 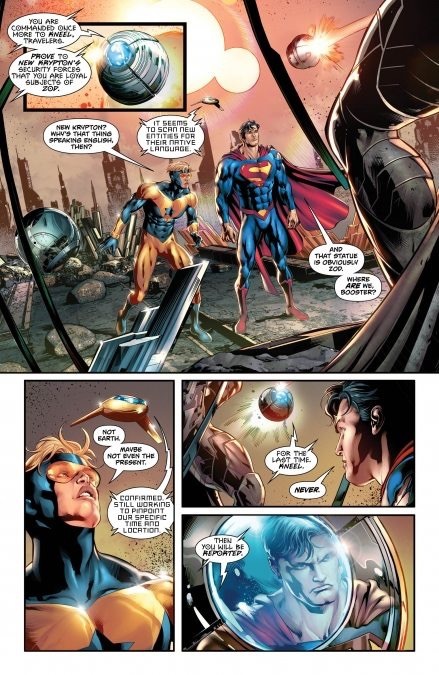 In particular, he excels at drawing “buddy cop” moments, of which there are plenty in this story, as Booster and Supes rarely have things go their way. It’s not a very linear (HA!) story, but still a fun romp seeing them get in and out of trouble. The real star artist of this volume, though, is Will Conrad, who I’d never heard of before picking this up! Roughlybhalf the issues in this volume are drawn by him. His pencils are smooth and very clean, seemingly without needing an inker all that much. His action scenes are great, his down time scenes are great, he draws both men and women well, Metropolis and sci-fi settings… his style just works. I know I for one would LOVE to see more of his work, preferably on a Superman book, if possible. I even checked out his Twitter account but didn’t find much there other than old previews of this Action story… one wonders why he hasn’t worked on stuff like this before! 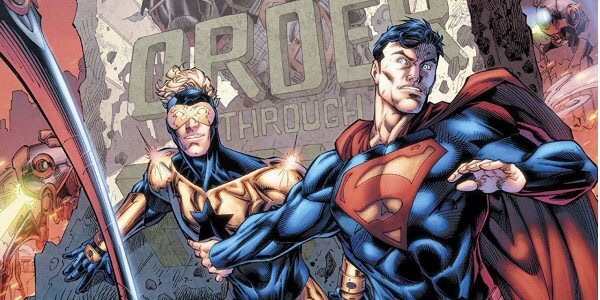 “Booster Shot” concludes with Superman and Booster Gold having to fight their way out of a planet in an alternate timeline that is being controlled by General Zod and his family. Zod is always a great foil for Supes, in that he can go toe-to-toe with him on a physical level, and also an ideological one. 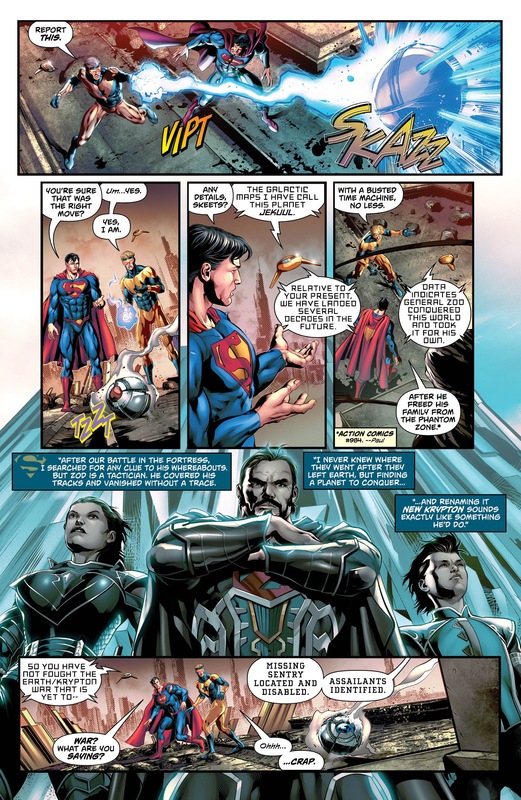 He has always been Jor-El’s counterpart, an inversion of the ideals which Superman’s father stood for on Krypton and what Jor-El might have become without the same moral restraint, very much like Professor X’s Magneto. To my knowledge, Jurgens has seldom, if ever, used this character prior to DC Rebirth, but he is used to perfection here! Without giving everything away, the action really climaxes on Zod’s planet, but beyond that, the reason the story works is because Zod is depicted as having a family. Although Zod having a child was part of the great Last Son, here it feels fresh and original because it is juxtaposed against Superman’s family. 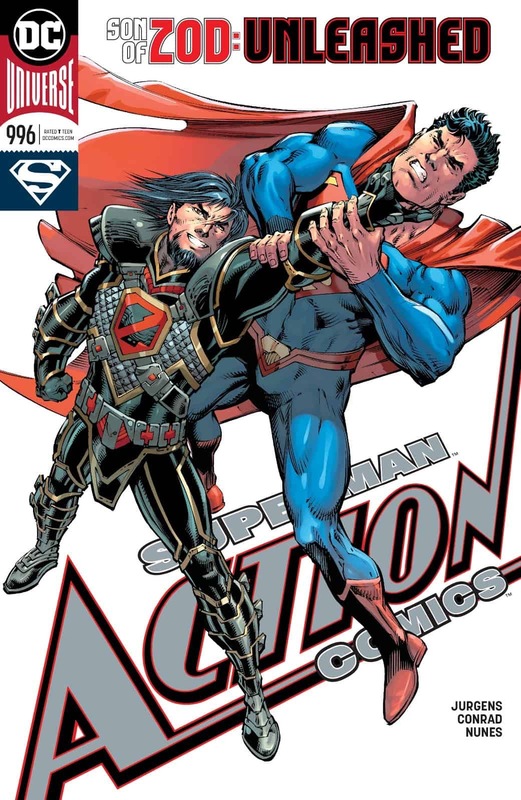 As I mentioned in my review of Tomasi, Gleason and Mahnke’s fantastic “Imperious Lex,” this entire run of Superman and Action Comics has been all about Superman as a family man, which has been wonderful. When Superman’s opponents don’t just match up with Superman, but with his family, it creates something very interesting that we the fans have not seen before. Supes’ family goes from the background very much to the foreground, and remains there throughout. The conflict that comes out of these plotlines is great, and great sci-fi action and concepts are a cherry on top. Family is very much a theme in this book. In these pages we have Superman and Booster Gold facing Zod’s family, Zod vs. another generation of the House of El, Superman searching for the truth about his father’s fate, a great B-plot and one-off story at the end of this volume about Lois trying to reconcile with her estranged father (Jonathan’s grandfather he has never met, as Jon mentions). Jurgens proves he understands this theme full well, and it makes these stories- his whole run, really- some of the best work of his career, indeed, maybe the best ever after Death and Return. Other Superman books that have been on the shelves at any point the last two years maybe enjoyable and well-crafted, in their own right (Trinity springs to mind), but the Rebirth books have been a cut above, in large part because of this beautiful new theme. Everything here just works. There are a few tidbits in this volume I also enjoyed a great deal even if they don’t have a whole lot to do with the main story, namely, the Cyborg Superman’s rehabilitation and Superman’s concluding that the Phantom Zone is too inhumane to use anymore. 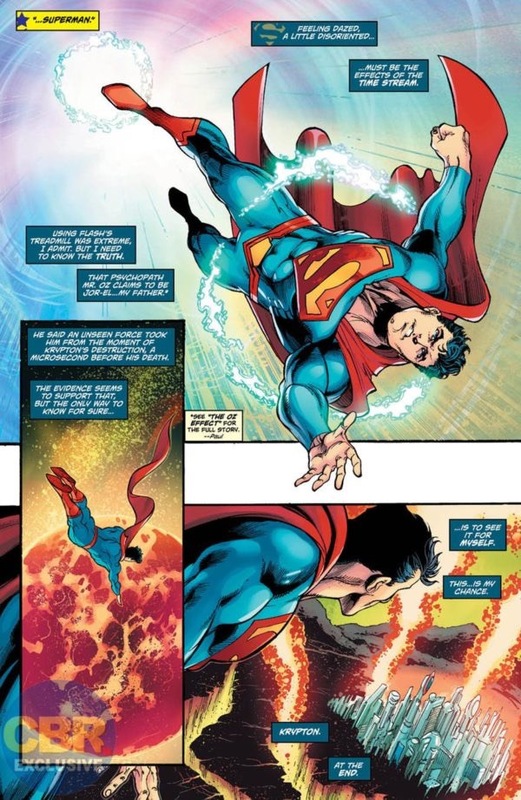 Both of these storylines are a breath of fresh air, in that they are a direct continuation of Superman’s story. I personally want to see characters I grew up reading continuing their stories- being allowed to age, shift status quo, etc. That’s exactly what we get here, and really, what we’ve gotten all along with Supes and Lois Lane through Rebirth. 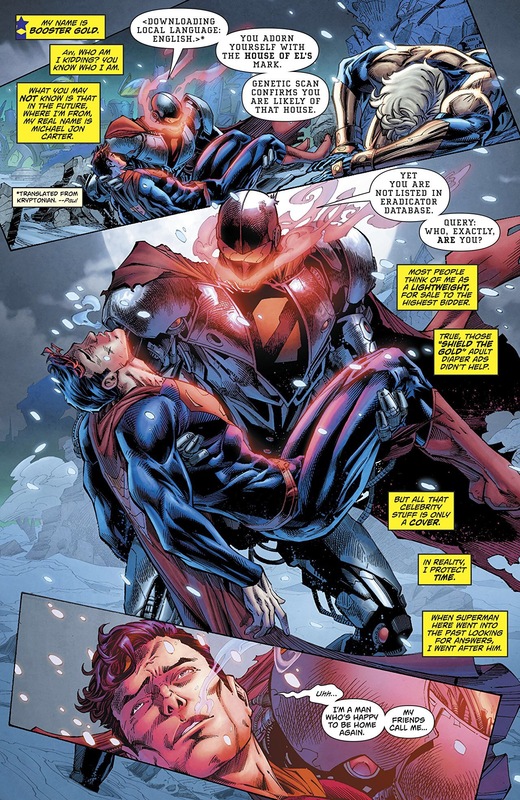 When Superman places the Cyborg in a holding cell in the Fortress of Solitude at the end of the story, it felt like the logical next chapter of what Jurgens himself began nearly three decades ago. Both this, the Phantom Zone tidbit, and even the reveal of the villain in the final chapter of this volume, all feel like a logical, satisfying continuation of the character’s story. If only the Big Two would allow this to happen a bit more, I think we’d all be the better for it. In the end, this latest volume of Action Comics shows that this run has been a great, great ride and a solid entry into the history of a phenomenal character. How fitting, and bittersweet, that we get this on the year of Superman’s eightieth birthday. I wish it were continuing, as neither Rebirth book showed any signs of stopping, or even slowing down, and could have gone longer if they didn’t have to make way for Bendis’ arrival. 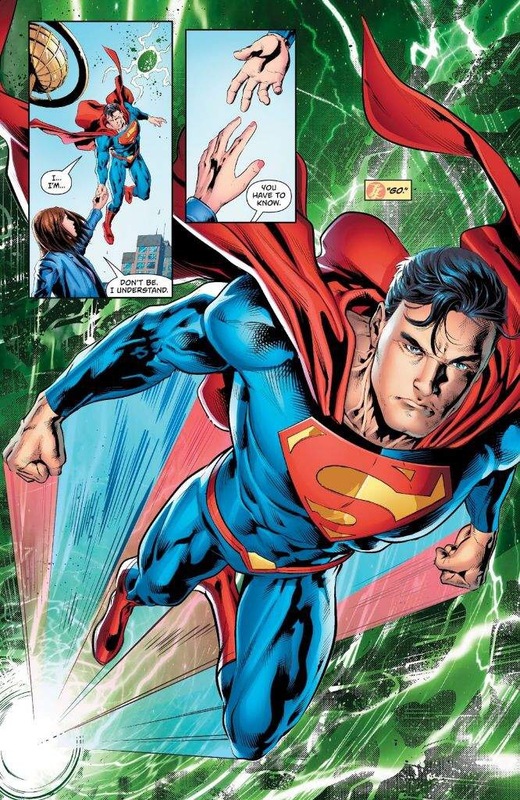 Nevertheless, Dan Jurgens’ stories remain very strong, and I’m thankful for what we did get. I can’t recommend these books enough. A huge thank you to everyone who was involved in making them.